Shortly after uploading my web page entitled "Seeking the psychic cow" I was invited to draw caricature & perform mime at an event in Medina, Ohio whose guest of honor requested to be drawn with his pet cow. Lucky ( the cow ) looked just like the cow on my page! Talk about your Deja-MOO! Wow, the cows are coming home! A few days after the party, someone on my block turned 21 years old. 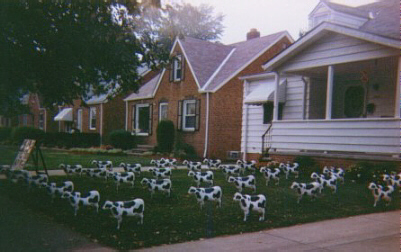 The family had 21 black & white cows ( just like lucky and the psychic cow ) placed on the front lawn to commemorate the event. haha. This is amazing. One evening I received an invitation to a nightclub to listen to a jazz band. I decided to bring my drawing board in the event I felt like drawing. When we got to the club a woman came up to me and said; "Oh, you must be the artist we called this morning to draw the band!" Uh, not exactly. Interesting, the artist who did receive the call did not show up, but I did with drawing board in hand!